Dr. Mewbourne was born in Birmingham, Alabama and attended The University of Alabama for undergraduate study. Afterwards , he earned his Medical Doctorate at the University of Alabama School of Medicine in Birmingham. While in medical school, he met his future wife, Jackie. Dr. Mewbourne began his surgical practice in Gallatin in 2007, after completing a General Surgery Residency at Baylor University Medical Center in Dallas, TX. 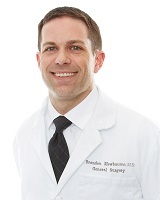 After 6 years of solo practice, he recently joined Sumner Medical Group in July 2013. He and his wife Jackie reside in Hendersonville with their two daughters Claire and Audrey. Focusing on all aspects of general surgery, Dr. Mewbourne has recently begun to offer advanced robotic assisted surgeries that utilize the da Vinci system. He also provides wound care surgery and serves as Medical Director for the Sumner Wound Care Center. An avid University of Alabama football fan, Dr. Mewbourne also enjoys Crossfit, and he and his wife participate yearly in the Country Music Half Marathon. Board Certified as well as a Fellow of the American College of Surgeons, Dr. Mewbourne also serves as the current Chief of Staff at Sumner Regional Medical Center.